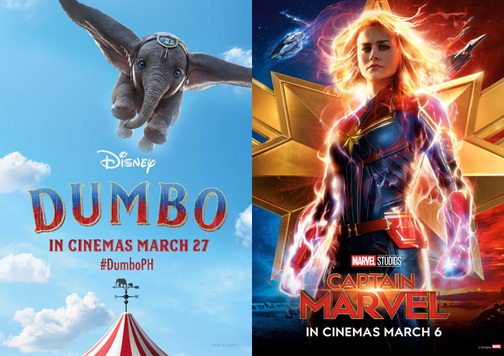 March marks an exciting month for Disney and Marvel fans in the Philippines as the entertainment studio brings two of its biggest releases for the year – Captain Marvel and Dumbo. Captain Marvel stays at No. 1 in its second weekend, with a box office total of $760.2M to date. This March 27, another Disney film is heading into cinemas nationwide—the live-action reimagining of the 1941 animated feature which follows the classic story of the giant elephant with big ears, Dumbo. The beloved children’s tale returns to soar to new heights with visionary director, Tim Burton, leading an all-star cast to bring to life a heartwarming adventure where differences are celebrated, family is cherished, and dreams take flight. Dumbo is one of the many live-action films that Disney has lined up for its families this year. The entertainment studio is well-loved by fans of all ages for its unparalleled storytelling that showcases heart, hope, and love for family. Its first full-length animated feature film, Snow White and the Seven Dwarfs, was released in 1937, and since then, the Walt Disney Studio has been bringing quality movies to the market. Following the release of Captain Marvel and Dumbo this month, Disney will be bringing an exciting summer with the much-awaited Avengers: Endgame and Disney Princess remake, Aladdin, coming out in April and May, respectively.